You are browsing the archive for Open Data Handbook. On 7 August 2017 Open Knowledge Nepal launched the first version of Nepali Open Data Handbook – An introductory guidebook used by governments and civil society organizations around the world as an introduction and blueprint for open data projects. The book was launched by Mr. Krishna Hari Baskota, Chief Information Commissioner of National Information Commission, Dr. Nama Raj Budhathoki, Executive Director of Kathmandu Living Labs and Mr. Nikesh Balami, CEO of Open Knowledge Nepal at the event organized at Moods Lounge, Bluebird Mall, Kathmandu. Around 50 people working in the different sectors of open data attended the launch program. The Open Data Handbook has been translated into more than 18 languages including Chinese, French, German, Indonesian, Italian, Japanese, Portuguese, Russian, Spanish. Now the Nepali language is also available at www.opendatahandbook.org. At the event a hard copy version of the Open Data Handbook was launched, which included the content from Global Open Data Handbook, Licensing terms from the Open Definition, some notable featured Open Data projects of Nepal and the process of asking information of the Nepal government using the Right To Information Act. Open Knowledge Nepal believes the Nepali version of the Open Data Handbook will work as a perfect resource for government and civil society organizations (CSOs) to expand their understandings of open data and, ultimately, reap its benefits. Speaking at the event, Mr. Nikesh Balami, CEO of Open Knowledge Nepal said “I believe that this Nepali version of the Open Data Handbook will help government policymakers, leaders, and citizens understand open data in their native language. It will also be a useful resource for CSOs to use for their own open data awareness programs, as well as data journalists who rely on data openness to report on local stories.” He thanked the volunteer who contributed on the translation, feedback, and review of the Handbook. Mr. Krishna Hari Baskota, Chief Information Commissioner stressed the need for people in government to understand the value of open data. He also remarked that while the Nepal government is already a treasure trove of data, there is a need for more data to be created and made open. He highlighted the journey traveled by the Nepal Government in the path of open data and motivated youths to join the momentum. Dr. Nama Raj Budhathoki, Executive Director of Kathmandu Living Labs said, “There should be an equal balance between supply and demand side of data and it’s a perfect time for Nepal to shift from Creation to Use”. Dr. Budhathoki shared his experiences of creating open data with OpenStreetMap and household surveys, and acknowledged the need for use of open data. Open Knowledge Nepal envisions the impact of the Open Data Handbook to be mainly around the four different themes of open data: improving government, empowering citizens, creating opportunity, and solving public problems. To achieve impact within these different themes, solely having a good supply of data is not enough. We also need to ensure that the demand side is strong by increasing innovation, engagement, and reusability of published data. This Handbook will make it easier for government officials and the citizens of Nepal to learn more about open data in their native language. In doing so, it will help create a balanced environment between the supply and demand side of data, which in the long run will help promote and institutionalize transparency, accountability and citizen engagement in Nepal. The name of the Individual or Organization Funders will be written in the book explicitly. Interested Organization or Individual can contact: nikeshbalami@gmail.com for more information. Open Data Barometer 2015, a global annual survey that measures and ranks the availability, readiness, and impact of open (government) data of nations ranked Nepal at position 68 among 92 countries surveyed. Nepal’s overall score is 13.09, Readiness score is 22, Implementation score is 12, and Impact score is 8. The scores are relative to world leader UK’s score of 100 in all measures – readiness, implementation, and impact. The scoring and rankings are comparable in other surveys, including the Open Knowledge’s Global Open Data Index in 2014 and 2015. This gives us a clear picture of state of Open Government Data in Nepal that Nepal’s government can be more open by implementing open government plans and actions and increasing the impact of open data on overall economy of Nepal. This is actually a decrease in Nepal’s ranking compared to Open Data Barometer 2014 by 7 places. Nepal scored similar grades in 2014 as it did in 2015. The decrease in ranking, even though the scoring is similar helps us to understand that while Nepal has made no significant progress towards an open government, other countries leapfrogged Nepal. The same scenario repeated in Nepal Open Data Index 2015, which highlights the understanding of Open Data in the local cities of Nepal is very poor. Open Data is steadily gaining momentum in Nepal, led by Civil Society, and joined by handful of government agencies. The progress made is slow. The reasons for slow uptake of open data practices are many. One of them is that a state of confusion is created when people do not know about the meaning and benefits of Open Data due to lack of proper guidance and resources. We are trying to localize Open Data Handbook in Nepali. We believe this Open Data Handbook Nepali Version will help Government policy makers, leaders and common citizens to understand about Data in their Native language easily and CSO can take their awareness program in next level by using the resources. We live in the generation where people want their government to be more Transparent and Accountable than ever and want to be engaged with every kinds of government decisions and activities to increase innovation & efficiency, which will lead their country towards sustainable development. The only way for the government to increase the citizens’ engagement in government activities and to increase transparency is Open Data. “Open Data is data that can be freely used, reused and redistributed by anyone – subject only, at most, to the requirement to attribute and sharealike.” Open Data not only increases transparency and accountability, but also promotes greater efficiency and effectiveness in the delivery of public services by allowing users to easily consume and interpret data. Recent years have witnessed considerable enthusiasm over the opportunities offered by open data. Across sectors, it is widely believed today that we are entering a new era of information openness and transparency, and that this has the potential to spur economic innovation, social transformation, and fresh forms of political and government accountability. Yet despite the evident potential of open data, and despite the growing amounts of information being released by governments and corporations, little is actually known about its use and impact. The condition of its is more poor in Nepal because Nepal lack resources in Native language for Open Data awareness. This Nepali Version Handbook will works as an perfect resource which government and CSO can use for awareness program. Open Data Handbook (first issued in 2010 and regularly updated) is the guide to open data, and especially open government data is the project of Open Knowledge International. It has been translated into more than 18 languages including Chinese, English, French, German, Indonesian, Italian, Japanese, Portuguese, Russian and Spanish, and has been used by governments and civil society organisations around the world as an introduction and blue-print for open data projects. Open Knowledge Nepal the working group of Open Knowledge International in Nepal is leading the project. Open Knowledge is a nonprofit based in Cambridge, United Kingdom. In Nepal, Open Knowledge Nepal works as an open network of young people who are passionate about open data, open science, open development, and openness in general. Members of Open Knowledge Nepal have been working with other governmental and non-governmental organizations in works related to open knowledge, especially open data and open government data. The family of the group contains professors, students, activists, journalists, government officers from various fields as an members and supporters. Open Data and Transparency is one of the oldest thematic areas for the group and has been engaged with it since a while. The group has been involved in research, advocacy, training, organizing meetups and hackathons, and developing tools related to Open Data, Open Access, Open Development and others. It is a non-profit open network of open knowledge enthusiasts and was founded in 2013. The name of the Individual or Organization Funders will be written in the book explicitly. Interested organization and individual can contact project co-ordinator: nikeshbalami@gmail.com for more information. The most important thing for the Network team at Open Knowledge International is the community we build around data. The tools we build to achieve this are crucial as well since they allow people to make even more and better plans and projects. To continue doing this, we are restructuring a bunch of technological tools for the community use. In this case, we are moving valuable information from our old Wiki server to the Open Data Handbook. Throughout the years, our wiki has been filled with lots of knowledge, but in the last year, we have seen a decline in its ongoing updates and usage. We, therefore, decided that the best way to share and publish knowledge for our network will be the handbook. Originally published in 2012, the Handbook has become the go-to resource for the open data community. It was written by the expert members of the open data community and has been translated into over 18 languages. Whether you want to learn about the why and how of open data or you’re working on a particular subject, the Handbook can serve as a resource for how to open data, finding use cases or a bunch of different resources that we’ve collected. However, we realised we were missing a vital part of building a community around data: Events! To fix this, we added a section on Making Data Social. Whether it is an online event, a meeting to talk about data or showcase some work, we’ve gathered all the Open Knowledge Network learnings from past years and put them in a centralized place, guiding you step by step on how to run an event around data. As always, we welcome input and translations to other languages from anyone in the community. Just submit your pull request and we’ll look into including the submissions. This blog post was written by the NDI election team -Michael McNulty and Benjamin Mindes How “open” are election results data around the world? Answering that question just became much easier. For the first time, the Global Open Data Index 2015 assessed election results data based on whether the results are made available at the polling station level. In previous years, the Index looked at whether election results were available at a higher (constituency/district) level, but not at the polling station level. As a result, the 2015 Global Open Data Index provides the most useful global assessment to date on which countries are and are not making election results available in an open way. It also highlights specific open data principles that most countries are meeting, as well as principles that most countries are not meeting. This helps inform the reform agenda for open election data advocates in the months and years ahead. Before we take a look at the findings and possible ways forward, let’s first consider why the Global Open Data Index’s shift from constituency/district level results to polling station results is important. This shift in criteria has shaken up the rankings this year, which has caused some discussion about why polling station-level results matter. Read on to find out! Why are Polling Station-level Election Results Important? Meets the open data principle of “granularity” A commonly accepted open data principle is that data should be made available at the most granular, or “primary,” level — the level at which the source data is collected. (See the the 8 Principles of Open Government Data principle on Primary; and the G8 Open Data Charter section on Quality and Quantity.) In the case of election results, the primary level refers to the location where voters cast their ballots — the polling station. (See the Open Election Data Initiative section on Granularity. Polling stations are sometimes called precincts, polling streams, or tables depending on the context) So, if election results are not counted at the polling station level and/or only made available in an aggregate form, such as only at the ward/constituency/district level, then that dataset is not truly open, since it does not meet the principle of granularity. 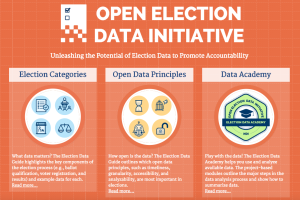 (See the Open Election Data Initiative section on Election Results for more details.) Promotes transparency and public confidence Transparency means that each step is open to scrutiny and that there can be an independent verification the process. If results aren’t counted and made public at the polling station level, there is a clear lack of transparency, because there is no way to verify whether the higher-level tabulated results can be trusted. This makes election fraud easier to conceal and mistakes harder to catch, which can undermine public confidence in elections, distort the will of the voter, and, in a close election, even change the outcome. For example, let’s imagine that a tabulation center is aggregating ballots from 10 polling stations. Independent observers at two of those polling stations reported several people voting multiple times, as well as officials stuffing ballot boxes. If polling station results were made available, observers could check whether the number of ballots cast exceeds the number of registered voters at those polling stations, which would support the observers’ findings of fraud. However, if polling station level results aren’t made available, the results from the two “problem” polling stations would be mixed in with the other eight polling stations. There would be no way to verify what the turnout was at the two problem polling stations, and, thus, no way to cross-check the observers’ findings with the official results. Reduces tension Election observers can combine their assessment of the election day process with results data to verify or dispel rumors at specific polling stations, but only if polling station-level results are made public. Bolsters public engagement When voters are able to check the results in their own community (at their polling station), it can help build confidence and increase their engagement and interest in elections. Enhances and expands the uses of election results data It can be used to help enhance participation rates. Civil society groups can use polling station-level turnout data to more precisely target their voter education and mobilization campaigns during the next elections. Political parties and candidates can if high invalid ballot rates are found in specific PSs, it can help groups target their voter info campaigns the next time. Aligns with an emerging global norm Making results available at the polling station level is rapidly becoming a global norm. In most countries, political parties, election observers, the media, and voters have come to expect nothing less than for polling station level results to be posted publicly in a timely way and shared freely. The 2015 Open Data Index shows how common this practice has become. Of the 122 countries studied, 71 of them (58%) provide election results (including results, registered voters, and number of invalid and spoiled ballots) at the polling station level. There are some significant differences across regions, however. Sub Saharan Africa and Asia had lowest percentage of countries that provide polling station level results data (42% and 41% respectively). Eastern Europe and Latin America have the highest percentage of countries with 71% each. What Does the Index Tell Us about How to Open Up and Use Election Data? Drawing on the 2015 Global Open Data Index findings and on open election data initiatives at the global, regional and national levels, we’ve highlighted some key priorities below. 1. Advocacy for making polling-station level results publicly available While most countries make polling-station level results available, over 40% of the 112 countries researched in the Global Open Data Index still do not. At a regional level, Sub Saharan Africa, Asia and the Middle East & North Africa have the furthest to go. 2. Ensuring election results data is truly open Making election data available is good first step, but it can’t be freely and easily used and redistributed by the public if it is not truly “open.” Election data is open when it is released in a manner that is granular, available for free online, complete and in bulk, analyzable (machine-readable), non-proprietary, non-discriminatory and available to anyone, license-free and permanent. Equally as important, election data must be released in a timely way. For election results, this means near real-time publication of provisional polling station results, with frequent updates. The Global Open Data Index assesses many of these criteria, and the 2015 findings help highlight which criteria are more and less commonly met across the globe. On the positive side, of the 71 countries that make polling-station level results available, nearly all of them provide the data in a digital (90%), online (89%), public (89%) and free (87%) manner. In addition, 92% of those 71 countries have up-to-date data. However, there are some significant shortcomings across most countries. Only 46% of the 71 countries provided data that was analyzable (machine readable). Similarly, only 46% of countries studied provided complete, bulk data sets. Western Europe (67%) had the highest percentage of countries providing complete, bulk data, while Middle East & North Africa and Sub Saharan Africa (both 38%) had the lowest percentage of countries doing so. 3. Not just election results: Making other types of election data open While election results often get the most attention, election data goes far beyond results. It involves information relating to all aspects of the electoral cycle, including the legal framework, decisionmaking processes, electoral boundaries, polling stations, campaign finance, voter registry, ballot qualification, procurement, and complaints and disputes resolution. All of these categories of data are essential assessing the integrity of elections, and open data principles should be applied to all of them. 4. Moving from transparency to accountability Opening election data helps make elections more transparent, but that’s just the beginning. To unlock the potential of election data, people need to have the knowledge and skills to analyze and use the data to promote greater inclusiveness and public engagement in the process, as well as to hold electoral actors, such as election management bodies and political parties, accountable. For example, with polling station data, citizen election observer groups around the world have used statistics to deploy observers to a random, representative sample of polling stations, giving them a comprehensive, accurate assessment of election day processes. With access to the voters list, many observer groups verify the accuracy of the list and highlight areas for improvement in the next elections. Despite the increasing availability of election data, in most countries parties, the media and civil society do not yet have the capacity to take full advantage of the possibilities. The National Democratic Institute (NDI) is developing resources and tools to help equip electoral stakeholders, particularly citizen election observers, to use and analyze election data. We encourage more efforts like this so that the use of election data can reach its full potential. For more on NDI’s Open Election Data Initiative, check out the website (available in English, Spanish and Arabic) and like us on Facebook. We are thrilled to announce that the Open Data Handbook, the premier guide for open data newcomers and veterans alike, has received a much needed update! The Open Data Handbook, originally published in 2012, has become the go to resource for the open data community. It was written by expert members of the open data community and has been translated into over 18 languages. Read it now » The Open Data Handbook elaborates on the what, why & how of open data. In other words – what data should be open, what are the social and economic benefits of opening that data, and how to make effective use of it once it is opened. The handbook is targeted at a broad audience, including civil servants, journalists, activists, developers, and researchers as well as open data publishers. Our aim is to ensure open data is widely available and applied in as many contexts as possible, we welcome your efforts to grow the open knowledge movement in this way! The idea of open data is really catching on and we have learned many important lessons over the past three years. We believe that is time that the Open Data Handbook reflect these learnings. The revised Open Data Handbook has a number of new features and plenty of ways to contribute your experience and knowledge, please do! The original open data guide discussed the theoretical reasons for opening up data – increasing transparency and accountability of government, improving public and commercial services, stimulating innovation etc. We have now reached a point where we are able to go beyond theoretical arguments — we have real stories that document the benefits open data has on our lives. The Open Data Value Stories are use cases from across the open knowledge network that highlighting the social and economic value and the varied applications of open data in the world. This is by no means an exhaustive list; in fact just the beginning! If you have an open data value story that you would like to contribute, please get in touch. The Open Data Guide remains the premier open data how-to resource and in the coming months we will be adding new sections and features! For the time being, we have moved the guide to Github to streamline contributions and facilitate translation. We will be reaching out to the community shortly to determine what new content we should be prioritising. While in 2012, when we originally published the open data guide, the open data community was still emerging and resources remained scarce, today as the global open data community is mature, international and diverse and resources now exist that reflect this maturity and diversity. The Open Data Resource Library is curated collection of resources, including articles, longer publications, how to guides, presentations and videos, produced by the global open data community — now available all in one place! If you want to contribute a resource, you can do so here! We are particularly interested in expanding the number of resources we have in languages other than English so please add them if you have them! Finally, as we are probably all aware, the open data community likes its jargon! While the original open data guide had a glossary of terms, it was far from exhaustive — especially for newcomers to the open data movement. In the updated version we have added over 80 new terms and concepts with easy to understand definitions! Have we missed something out? Let us know what we are missing here. The updated Open Data Handbook is a living resource! In the coming months, we will be adding new sections to the Open Data Guide and producing countless more value stories! We invite you to contribute your stories, your resources and your ideas! Thank you for your contributions past, present and future and your continued efforts in pushing this movement forward. Open Data Handbook 2015 comeback – and you want to be a part of it! There is famous saying that says that outside of a dog, a book is a man’s best friend. We at Open Knowledge tend to agree. This is why we decided to take one of Open Knowledge key resources, the Open Data Handbook, and give it a bit of a face lift in this upcoming year. The open data handbook has been an important resource for the open knowledge community for years. The handbook introduces and discusses legal, social and technical aspects of open data. It has been used by a wide range of stakeholders from open data beginners to data wizards, from government officials to journalists and civil society activists. It examines the following questions which are relevant to all: what is “open”, why to open up data, and the how to ‘open’ data? Since it was first written, the handbook is read by thousands of users each month and has been translated into 18 languages (making the most widely translated Open Data resource out there) . However, open data is both a fast moving and a relatively field. As such, it is not surprising that open data initiatives have been launched and open data policies approved, we, as a community, have learned a lot about the opportunities and the pitfalls of open data. The last version of the book is from 2011 and at the time, government open data portals were few and far between and the open government partnership had only just launched. The book represents what we new/thought then but as the open data movement expanded both in terms of numbers and in geographical spread, we have decided that it is high time that we incorporate our learnings into a new version. This version of the Open Data handbook will focus mainly on one main type of open data: open government data, but a number of the sections can be applied to other types of open data. This project is supported by Partnership for Open Data – a collaboration between Open Knowledge, Open Data Institute and the World Bank. So much of this knowledge, these stories and the brilliant ideas about what works and what doesn’t work is in this community. Therefore, we believe that the process of creating the updated version of handbook should be, as its always been, a community project. This process can not only strengthen the community through a joint project, but also to help us to learn from peers, listen to members who usually do not participate in daily channels and to create a handbook, rich in content, experience and a wide spectrum of knowledge. There are a number of ways you can get involved! You can submit your stories or comment on the “alpha” version we are planning to launch in February. The handbook will be part of a larger community owned resource platform and we have How can you help? Contribute a short open data story – We are looking to different stories about open government data stories in various fields. It can be a success story or even a failure that you think we should all learn about. If you want to contribute a story please fill this form and we will get back in touch with you. Revise the first draft of the book – The current chapters in the open data handbook are being review by Open Knowledge staff – we are updating and producing new . Our goal is to release an ‘alpha’ version of the book the week before open data day, so it can be revised, commented on and added to by the community. Propose a resource – We are putting together a list of open data resources – If you know of other resources about open data, in any language, please give us a shout. At the end of each section, we will have a “further reading” section and we’d love to share as many resources as possible. Tell us an example of open data having an social and/or economic impact in your city/country/region What is your main obstacle dealing with Open Data? How do you / your community engage with open data? What do you think is the next big thing for Open Data in 2015? The videos will be embedded in the handbook and on our YouTube channel! Who can write to the book? Everyone! While we are editing the book are editing the book, we want your input. Unfortunately, we can’t promise that every story / idea will ultimately be part of the book. If you think that we are missing something, please let us know! We will try to include as much as possible! If you have any comments or suggestions, please email us at handbook [at] okfn [dot] org 2015 is going to be great for open data, let’s write about it together. Comments Off on Open Data Handbook 2015 comeback – and you want to be a part of it!